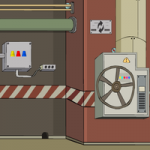 GFG Underground Machine Escape is another point & click escape game developed by GenieFunGames. In this game, you have been trapped at a place with an underground machine. This is totally abnormal, so be careful and try to escape from there. You can find useful stuff and clues for interesting puzzles to solve and finally escape from this place. Good luck and have fun! Hi all and thx GFG for this game. Bruteforced the 4 colors puzzle although having the device showing the thunder with the hand pointing between pink and blue. Maybe some smart people may explain ? no cloth needed, sneaky dots for spots, nice.